An important part of any estate plan, an Advance Directive allows you to make important end-of-life decisions about your personal healthcare. This is crucial as, at some point, such as in the event you fall into a coma or are otherwise incapacitated, you may not be able to verbalize these wishes. An Advance Directive is a way to put those on wishes on record for your family, your heirs, and your health care provider. You want to spell out your health care wishes. You want a complete estate plan. You have recently been diagnosed with a serious disease. You have strong convictions about life support or other health care choices. Please note that Rocket Lawyer's Advance Directive is the same form as our Living Will. 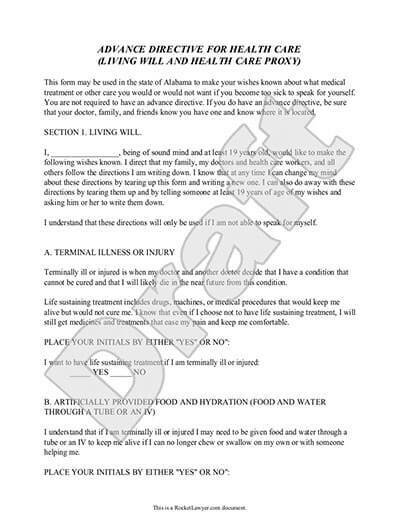 In general, an Advance Directive expresses specific instructions you have regarding your healthcare. It also enables you to designate another person ("Agent") to make healthcare decisions on your behalf. Advance Directive requirements and scope vary state-by-state. Rocket Lawyer easily provides you with the correct form to use for the state you live in. An Advance Directive does not address anything related to your finances. If you want to give authority to someone to make decisions regarding your finances, you will need Rocket Lawyer's Power of Attorney form. Consult with a lawyer if you have questions. Making anatomical gifts, authorizing an autopsy and directing disposition of remains. If the risks of treatment outweigh the benefits. If you do not want to receive food and fluids artificially regardless of your condition, you may specify this limitation. If you wish, you may also state under what circumstances you do not want treatment to alleviate pain or discomfort. You may also convey your instructions regarding organ or tissue donations including not wanting donation for any purposes or for what purposes you would want your organs or tissues to be donated. In your Advance Directive you may state any of your preferences including where you want to receive your treatment, your values and any other special instructions to your Agent. You may choose to have your Advance Directive become effective immediately (even if you are still capable of making your own healthcare decisions) or to have your Advance Directive only become effective when you are incapable of making healthcare decisions for yourself (this is the more common scenario). You may revoke your Advance Directive at any time by using Rocket Lawyer's Healthcare Power of Attorney-Revocation. Deciding who to appoint as your Agent in your Advance Directive is not always easy. Consider appointing someone who you trust, who lives near you and who is willing and able to take on this responsibility. You will want someone who actually has the time and energy to be available to make these decisions. It is important for you discuss the specifics of your Advance Directive with the person you want to appoint as your Agent so that they understand your wishes and can tell you whether they are willing to take on this very important role for you. It is also a good idea to appoint an Alternative Agent in your Advance Directive in case your first Agent is unwilling or unable to act on your behalf. 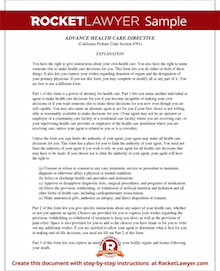 You should give copies of your Advance Directive to your Agent, your family members, your physician and any healthcare providers or institutions. Keep the original signed and date Advance Directive with your other important papers. It's also a good idea to make a note on the Advance Directive itself who you gave copies to in case you need to modify or revoke your Advance Directive. If you have any questions about what's right for you, we can connect you with a lawyer for quick answers or visit Rocket Lawyer's own Guide to Estate Planning to learn more about Advanced Directives and other estate planning essentials. Our step-by-step interview process makes creating a printable Advance Directive easy.